When you flip through a magazine or newspaper, you notice captions like,"Shanghai is a full of business potential." "Shanghai is hot." frequently. But what exactly is so "hot" about it? Two personnel, who connect Japanese talents and Shanghai, revealed their experiences and future thoughts of Shanghai to Mr. Nakasa. WHY--- WHY was it Shanghai? NOW--- How is Shanghai NOW? PEOPLE--- Who are the Shanghai PEOPLE? 3 MONTHS--- Can you do this in 3 MONTHS? Ichiro Sato, President of Age Co., Ltd.
Born in Tokyo in 1962. 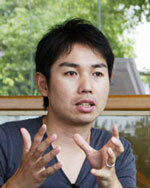 From 1984 to 1996, he worked for Super Potato, a design firm, and in 1996, he established Age, his design firm. He has been working on numerous commercial projects, with a concentration in restaurants. Yuichiro Hori, CEO of Fusion Trading Co., Ltd.
Born in Aichi prefecture in 1973. After graduating a university, he joined Marubeni Corporation, one of the major trading companies in Japan, and in 1999, he was transferred to the Shanghai Office. In 2002, he left the company and established FUSION INTERNATIONAL TRADING CO., LTD in December 2002. Nakasa: For me, everything started from an Izakaya (a Japanese style restaurant, where alcoholic beverages and foods are mainly served.) in Nagoya. Mr. Sato, Mr. Asada of Novarese, a wedding production company, and Mr. Tarumi of Ladakh Design Associates were there, and everyone was saying, “Shanghai, Shanghai.” Later, I sent my staff to Shanghai to see what is up, and look how far I’ve come now. It led to a publication of a photo book. Sato: For me, it is got to be a Chinese hot pot, right? Nakasa: So it really was a hot pot huh? Sato: It has got to be. Since I am Japanese and understand its history well, I can foresee the future of it. But in Shanghai, I cannot predict what way the city is going to drift. There is no past, no future, and the present is the only thing that exists. New things pop out every the other day, and I get a feeling that for Shanghai, the present is the only thing that matters. Hori: For me, it was the appointment to the Shanghai Office when I worked for a trade company. For the first three and half years of my Shanghai life as a trader, which includes 1998-1999, Shanghai was in the era of significant social change. It was in the middle of rapid economic growth, and as a catalyst, Beijing won the 2008 Olympic during this time. After going through such a dynamic time, I thought this would be the only time that I can live in the middle of the rapid economic growth. “This is what a great economy is all about.” I was able to feel it vividly. Then, in 2002, the company gave me a new assignment and it was based in Tokyo. By then, I wanted to immerse myself in Shanghai and work more, so I decided to leave the trading company and in the same year, I founded FUSION TRADING. Nakasa: In terms of the mass of the city, I think Shanghai is the densest in the world. Sato: There is no other city where its population is 20 million and yet, maintaining such a diversity. When it comes to the number it is a good barometer to judge what is good and what is bad. That's why in the near future, there will be more distinctiveness in winners and losers. Hori: The speed of the evolution and development is stunning. No one owned an automobile before, but since the last year, there’s a rapid increase in the ownership. Who could have imagined that its sales figure goes up 500 times more than the year before? To add more, the government is constructing many subway lines now. Sato: Once all the proposed subway lines are complete, its total distance will be 400km. Many people say that the Tokyo subway is complex, but it still is 300km! Hori: A maglev train is running from the airport to the city now, and at this moment, the last stop in the city is where the Expo will be held. In the future, it will extend to South Shanghai Station, and connects to Hangzhou in 30 minutes. It takes two hours by a car now and such a remote location will be taken into the Shanghai's economic area. Sato: The way Shanghai does things, it is so dynamic. Nakasa: It seems that the politics is following the business. Hori: Everyone seems to be living towards tomorrow optimistically. And they are tough too. China is the country, which accommodates the greatest number of people, and yet, the current problem is a lack of labor. If there is an opportunity, everyone is moving to there. It is like volkerwanderung. In this wave of people's movement, people are gathering in Shanghai as well. What is so special about Shanghai is that the city is a full of information. Meaning, there is a business opportunity. People are hoping to grab a Shanghai dream in here. PEOPLE---Who are the Shanghai PEOPLE? Sato: I've done a number of projects in Shanghai in the past, and so far, I did't change the way I design for Chinese people. But they tend to express their demand explicitly from the beginning. Hori: There is a person who works at a beauty salon and said, "Chinese people tend to express what they want explicitly." In a sense, the salon can strive to create a style that the customer wants and if she likes it, she will likely to come back again. But for Japanese, she does not express anything even though she thought, "This is a bit strange." As a consequence, she will not return to the salon without leaving any words. It's tough to understand what they are really thinking. To add more, Chinese people have a very strong identity of own. If a Chinese person has money, she is likely to allocate no budget limitation, but asks to, "make something that cannot be find anywhere." That is why some people create a building with a crown on the top. The building itself represents the self, and its mass form is what we call Hong Kong. Nakasa: Chinese thoughts are really based on their self-consciousnesses. Hori: Surely people have a pride on their race. Sato: The project was like a hit-or-miss situation. For the last two years, I have been visiting Shanghai for furniture productions, as well as searching for building materials. While I was checking out the quality of furniture, which I asked local manufacturers to build, I began to have an interest in initiating an interior design project in Shanghai. Also, I have been visiting many restaurants and began to realize that the improvement of the service is required. After having these thoughts, my conclusion was to start a eatery service project in here. I happened to have a chance to meet Mr. Fujio, the CEO of Fujio Food System, which operates Maido Ookini Shokudo, a Japanese eatery franchise, and asked him,"Do you have any interest in extending your restaurant chain to Shanghai?" He was in, and in the end, a team of Mr. Fujio, Mr. Hori, and I was formed. Hori: China in the 1990s had a policy, which encourages people to produce cheap stuff as much as possible, and take in as much foreign currency as possible. But when Fu Jingtao took over the government in 2003 there was a big change. His policy was to spend as much as possible in the domestic market and raise the wealth level of all the Chinese citizens. As a result, the demand for the domestic market expanded rapidly and many foreign companies began to have opportunities to open stores in Shanghai. When stores like these opens, people are likely to spend more money and generate a positive spiral of the economy. Maido Ookini Shokudo's main target is the mass market, and the restaurant is trying to provide the best food with a reasonable price range. 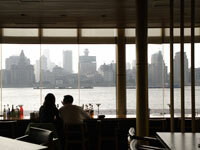 Its style is something that suits the current Shanghai's economic boom. 3 MONTHS---Can you do this in 3 MONTHS? Hori: When the project began we weren't incorporated in Shanghai yet. Rather, we just signed a contract for the property. There was no company, no employee, nothing. When someone begins a restaurant business the first step is incorporation. Then conduct market research to decide the target and budget, and finally the property. Our process was absolutely unusual, but you should know that in Shanghai, speed is crucial. With this process, we managed to open the store in 3 months. Sato: We had to find a good property as soon as possible because it tends to go away fast. 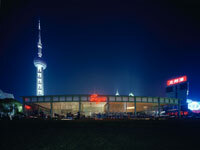 In Shanghai, it is common that a property you saw during the daytime has taken up by the evening. In our case, we managed to find a good one in the early stage of the research, so we decided to think about everything else later. When we had sometime to think about the operation, we realized there is Mr. Tou from Shanghai. He is happened to be a sore manager of Morimachi Shokudo in Osaka, one of the flagship restaurants of Fujio Food System. When we were looking for the restaurant manager for Shanghai we were like, "Oh, there's Mr. Tou." Hori: Mr. Tou barely understood what was going on with this Shanghai project. But we brought over him anyway. Sato: Every time when Mr. Tou is about to say, "I feel like heading back to Japan." We ask Mr. Fujio to come over to Shanghai. Then we say to him, "It will be a problem if Mr. Tou leaves Shanghai." After that, Mr. Fujio simply orders Mr. Tou, "You Should stay." He is still our restaurant manager. Sato: For the first restaurant, we decided to create the exact same restaurant as the one in Japan. But the process of its construction had a vast difference. I have to admit it was really interesting! The thing is, you cannot have a flat floor, because the architecture itself is skewed...... The floor is filled with the flooring but there is no idea of dinging in China. What they do instead is to place a marble on the entire floor, and then cover with the flooring. I thought the simple marble flooring does its complete job, but everyone is like that's how it is supposed to be done. It's so dynamic. Nakasa: I wonder if the budget works out OK with a marble. Hori: The restaurant is located near Shanghai Japanese School, meaning Japanese people are the main target of our customers. I guess this is the only marketing tactic we had. Sato: The restaurant opened in July and soon after, the Japanese School went into the summer break. Because of that, many Japanese families went back to Japan for a few months. We thought, "I was expecting you guys and Oh no!" That is something we did not anticipate, but surprisingly, the sales did not fall. Many local customers came over instead. Hori: Taiwanese, Hong Kongner, Korean, Singaporean, American...... Even many Europeans! Sato: We have a good balance of customers now. The most popular food is rice. We brought the cooker from Japan so you know what the taste is like! Hori: We have been planning the second and third Maido Ookini Shokudo restaurants now. It will be interesting! What I want to do in the future ? that is a real estate development. Shanghai is known as a business city, and you may realize that there is a lack of space to calm down or take things easy. This year, a man-made beach was made near Shanghai. It is an hour from here by a car. Because of the sands, constantly carried over from Yangzi River, there was no beach in the vicinity of Shanghai. But it was made possible by purifying the water and allocating a bank. This summer, about 30,000 people came over and it was simply packed with people. After seeing the crowd, I thought people are in need of spaces with nature. I want to create such an environment in an urban area. Say, take a break in Onsen, a hot spring, and perhaps, there is a sushi restaurant you can go after having Onsen. Maybe there is a hotel that you can sleep over. I want create this kind of facility for Shanghai people. Sato: Create something that you want. That will be the main motivation for trying something new. Probably Onsen is one of them. But in order to achieve it, I need to accumulate more experiences in Shanghai. I have been traveling to Shanghai every month recently and now I can eat a Shanghai crab really fast. My local business partner is even surprised with my skill! In a way, this could also be an accumulation of my Shanghai experience. Copyright © 2018 Nacasa & Partners Inc. all rights reserved.